I ordered a 20 pack of these club cigars from Cigar Terminal and they "disappeared" in New York Customs. When I notified Cigar Terminal, they immediately sent me a replacement...GREAT CUSTOMER SERVICE! These club cigars are really excellent for what they represent- a great little cigar that can be enjoyed in about 15 minutes. They are not meant to be compared with a full-sized quality Cuban. Overall, an enjoyable smoke- smooth, pleasing aroma, no spice. These are a great quick smoke with a nice mild flavor and great burn. 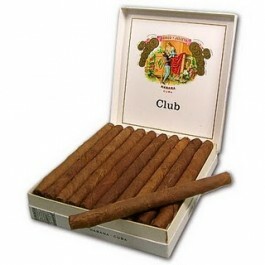 When I first started smoking cigars I stepped in slowly with a pack of these clubs. They were a good little transition cigar. (although I don't really consider clubs to be cigars) They weren't as good as the Cohibas or Toscanos but they passed the, "yes, I would smoke these again" test. A pack of 20 is a good sidekick when you're out fishing and can't smoke real cigars.